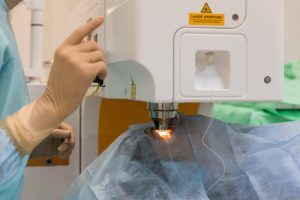 LASIK (laser-assisted in situ keratomileusis) is a safe and effective surgical procedure that helps correct nearsightedness, farsightedness, and/or astigmatism. It is the most commonly performed refractive surgery in the United States. We co-manage exclusively with corneal surgeons who are experts in the LASIK field to customize the procedure for your vision and lifestyle. Schedule an appointment today to see whether you are a candidate for LASIK.